- GMA : GREY - Untested - TESTERS NEEDED! 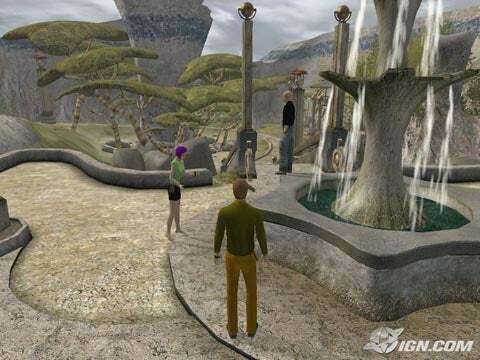 Myst Online: Uru Live is an open source massively multiplayer online adventure game developed by Cyan Worlds. The game is the multiplayer component to the 2003 video game Uru: Ages Beyond Myst. Like Uru, Myst Online takes place in 2000's New Mexico, where an ancient civilization known as the D'ni once thrived. The D'ni had the ability to create portals to other worlds or Ages by writing descriptive books of the Age. Players uncover clues and solve puzzles together; plot developments were added via episodic content updates. Uru's multiplayer segment was delayed and did not ship with the single-player component as planned; in February 2004 the multiplayer was scrapped entirely. Dedicated fans kept an unsupported version of the game alive through Cyan-maintained servers. Online game distributor GameTap resurrected the game as Myst Online in 2007, but this version was canceled due to a lack of subscribers despite generally positive reviews. Cyan received the rights to Myst Online from GameTap and has announced its intention to bring the game back. In 2010, Cyan Worlds released the game free of charge, under the name MO:ULagain. It is currently hosted on Cyan-maintained servers. I never really played this until a few weeks ago - I wanted to try it - so I thought I would share. My full port link went off line so I re-uploaded wrapper only. If someone would like me to re-post that instead of just the wrapper let me know. Full port re-uploaded - and wrapper added. Myst Online's gameplay is a massively multiplayer online game, where players interact with others to solve puzzles and advance the story. Players communicate with others using a "Ki", an artifact which provides a special interface. Each player has their own personal Age, called Relto; unlike in public areas, each player's Relto is different depending on the player's tastes. In public areas, any action a player takes is persistent and remains part of that world ie kick a stone in one player's game, for instance, and the stone will be moved when any other player enters the area. Myst Online takes place in fictitious caverns below Earth's surface. Thousands of years ago, a race known as the D'ni practiced a craft known as The Art. By writing special books describing a location, the D'ni created a link to that world. The D'ni had their own number system and language distinct from the humans dwelling above them. According to the story, though the D'ni society crumbled, archeologists discovered the caverns and teamed with a development studio (Cyan Worlds) to produce educational video games based on their findings; thus, the story in the Myst games is canonically findings from the caverns. New content and additions to the story were revealed through "episodes". - Video: nVidia 8xxx Series or AMD 3xxx or 4xxx Series Video Card recommended - any should work. To download you must use Firefox / Chrome or jdownloader - Safari will not work. Mount the dmg and drag the Myst Uru Live.app to your Application folder - Eject the disc image - Open your Application Folder click to play. Copy or install your game files to the default install directory - c_drive/Program Files/Uru Live (Blue Folders) - either download the files from the link below or - copy and paste them from the full port. 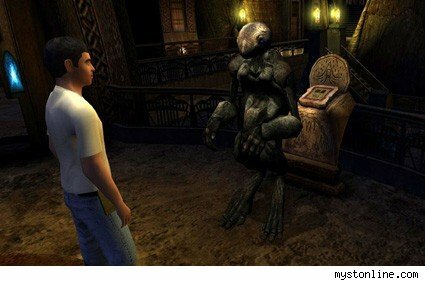 The game can be downloaded for free at http://mystonline.com/en/play/ - you also need to create a free account to play. Didin't Uru Live have a GameTap mac Cider Port? a long time ago when it came out.. one of the first to use Cider when Cider was brand new... but they finally decided to stop paying transgaming.. and killed the Mac client. i got sound issues. i think most of the loops will crack after a while. never ran into that. Try dsound? The original GameTap port had a major bug where players using mac couldn't use their microphone for voice chat. Does this port solve that issue? No idea, sorry. I do not use voice chat for anything computer or console gaming. Allright, thanks for the answer. I'll try it out. If the voice chat function works this will be pretty big news at the MO:UL again forum! I have sound issues with this wrapper as well. However, the same issues crop up when I create my own wrapper as well. It's probably something to do with the game itself running in wine. Thanks for the effort, though! Is this a wrapper or freeware, Because the game is not in the wrapper. That would be awesome if you could upload that Karacho! Yeah it works on crappy Mountain Lion - just not 10.8.2 - due to that point upgrade messing everything up. You can update the wrapper to make it work though. this game should work with any recent wine version. i tried it since 1.4 again and for a while there aren't any bugs. if someone still has sound issues, try making an own wrapper with wineskin - there should be some tutorials. just install uru in there, run it and nothing more.